At Sunday’s march on the Brayton Point coal plant in Massachusetts, I was reminded of what it takes for a movement to win. The middle-aged guy in the Fall River Herald News T-shirt was casually chatting up the cop, just some friendly mid-morning chit-chat, as I walked past them in the middle of Brayton Point Road in Somerset, Massachusetts, on Sunday. He was referring to the crowd of some 400 singing and chanting protesters moving toward us, marching to the Brayton Point coal-fired power plant down the street, carrying banners like “Gov. Patrick: Quit Coal,” “Coal Kills,” “There Is An Alternative” and “Just Transition For All.” Leading the march, which had the support of local community members and organizers, was a group of forty-four people—including college students, grandparents and mothers of young children—who would shortly be arrested for trespassing at the gates of the plant. 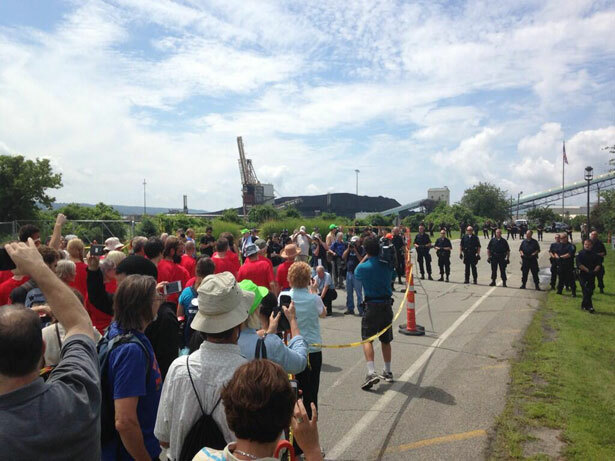 They engaged in peaceful civil disobedience to demonstrate the moral seriousness of their demand: that Governor Deval Patrick use his authority under the state’s Global Warming Solutions Act to close the largest coal plant in New England, one of the region’s largest sources of the carbon emissions that are catastrophically heating the planet. […]on the campaign trail last year, Obama followed the advice of his staff and barely mentioned climate change, to the dismay of his environmental base. Suddenly, that’s all changed. Now, it seems, Obama can’t stop talking about climate change. In both his Inaugural Address and the State of the Union, he spoke at length and with passion about his commitment to tackling the warming climate. Last month, in a sweeping, nearly hour-long speech, Obama presented a historic set of new climate policies, centered on Environmental Protection Agency regulations to slash coal pollution. EPA’s new administrator, Gina McCarthy, will soon set off on a high-profile road trip to tout the climate rules in speeches, public meetings, town halls, and wherever else there’s a case to be made. Davenport suggests there’s evidence of a “new politics” emerging around climate. If so, we might want to give just a little credit to the grassroots movement that we saw a small example of at Brayton Point, and that we’re seeing around the country this summer—a movement that’s been growing steadily since the Keystone protests at the White House began in August 2011, a turning point if there ever was one, putting climate at the center of an intensely lobbied and legacy-defining presidential decision. But McKibben is as clear-eyed about the odds we face as anyone you’ll meet. Because let’s not kid ourselves. Obama may be talking about climate change, and even pressing ahead with some welcome executive actions to curb carbon emissions. But we’re a long, long way from the kind of political change it will take to address climate in a serious way—that is, in a way that takes the science seriously—and truly alter the catastrophic course we’re on. The kind of change that could, for starters, put a strong price on carbon and an end to massive new investments in fossil-fuel infrastructure. To a lot of people, when you put it in those terms, the climate fight looks unwinnable—as naïve as trying to shut down a coal plant with nonviolent direct action. For others, including many of us who marched on Brayton Point, it’s reason to fight all the harder, and to commit ourselves for the long haul. We can’t help thinking of all the “unwinnable” fights of the past—to abolish slavery and end segregation, to win labor rights, women’s rights, gay rights—and we’re grateful for those naïve enough to have fought them. And to keep on fighting. The fossil fuel divestment campaign is about more than just reducing emissions—it also needs to address the intersecting issues of race, class and the environment.